Today the HTMS Khraam was on the list. 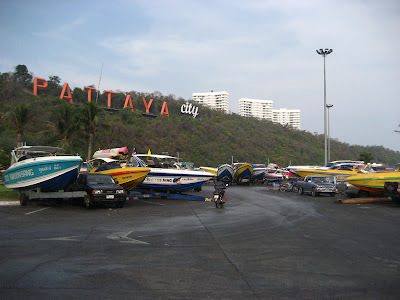 We gathered at 8 am at Seaduction's dive shop, opposite the Bali Hai Pier, at the end of Walking Street in Pattaya. It was all very relaxed and Danny who runs the shop together with Andy are nice folks. We loaded our Nitrox tanks on the boat and were off to the HTMS Khraam. Above is a great picture of the Khraam and she's a lovely wreck, sunk about 5 years by the Thai Navy for recreational divers. She's got a nice crust of plants and anemones and assorted other sea life on it's hulls and there are plenty of penetration points all over the wreck. We did two very nice and relaxed dives on the wreck, with Steve R. completing his wreck dive specialty and Marcus and Jamie completing their wreck dive Instructor Specialty. Visibility was fairly good between 7 and 10 meters and there was only a mild current during both dives. All in all a very relaxed day with some good diving! 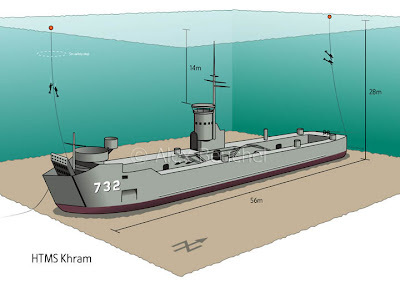 Tomorrow we're off to dive the HTMS Koot, a sister ship of the Khraam and sunk about a year ago. If you're interested in Thailand's wrecks, visit the Thai wreck diver webpages which has plenty of information about wrecks in Thailand on it.